Hello friends and behold the first Green Wagon Farm blog post! I have wanted to start a blog for the farm for some time and am so happy that it’s finally a reality. During farm season, especially in the fall, we always hear the question “What do you do after you close?” With this blog I hope to answer that question as well as give regular updates throughout the year. So what are we doing right now? We are grafting tomato plants! In the horticultural world, the definition of grafting is to insert a scion of a plant into a like stem or stock of another plant in which it continues to grow. The result of this process is a united rootstock and scion. This is a widely used practice all over the world and not just with tomatoes – apples, watermelons, avocados (to name a few) all use this process to produce high yields of fruit. We graft our tomato plants for several reasons. By taking a rootstock of one variety and a scion (top) of another we are able to create a strong, disease resistant plant that also produces flavorful, high quality fruit; the best of both worlds. This is especially important in greenhouse production because the plants are going into the same ground every season rather than being rotated year to year. 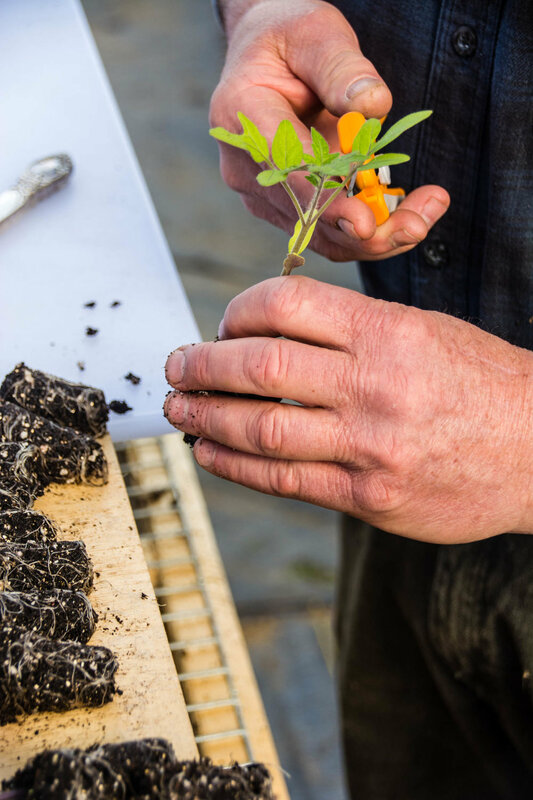 We replenish the soil health of our greenhouses every season with compost and other fertilizers, but it’s not enough to ensure the best quality tomatoes. Grafting is the best way to ensure top quality fruit and lots of it—plus, with strong plants they can continue to produce fruit for a longer period of time. Tomatoes are a labor of love. 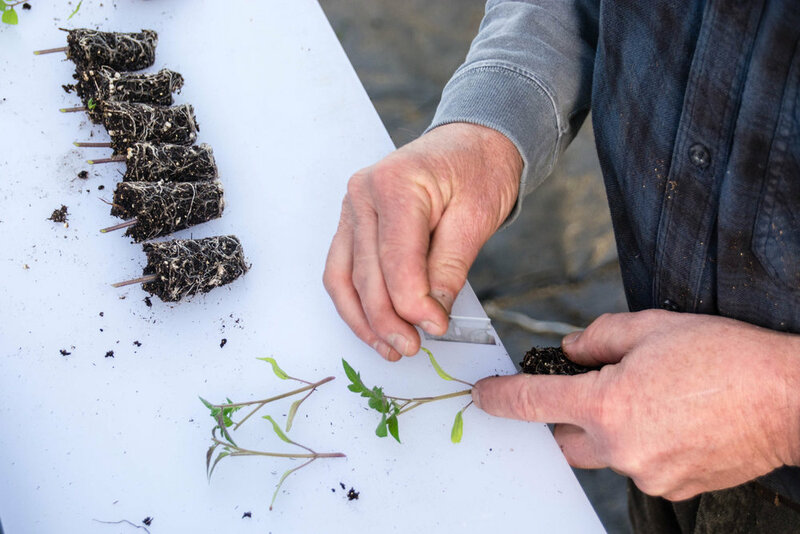 In order to harvest our first tomatoes at the beginning of June, we start our rootstock and scion varieties from seed during the last week of January. By the end of February and early March the seedlings are big enough to start the grafting process. First, the plants are selected according to stem size and maturity level. Farmer Bill has been grafting for over 10 years now. Next the plants are sorted into two groups - scions (tops) and rootstocks (bottoms). Rootstocks — the leaves don't look great on these plants but it doesn't matter because they are getting cut off anyway. We just want the roots. The leaves of the scion variety are trimmed a bit. This allows for the plant to focus more on healing rather than photosynthesis. The rootstock leaves are cut off with a clean, straight edge razor. In order to have a successful graft it is essential to have the diameter of the scion and rootstock to be the same size.When you find a match a small plastic clip is used to join the two together. This clip acts like a band aid as the plant heals and the tissues grow together. Newly grafted plants go inside our rehab tent or “plant hospital” for 4-5 days. This tent is completely dark, warm and very humid. This environment ensures the success rate of the graft. As the plant grows and heals we gradually increase the amount of light exposure it endures. There will be more pictures and updates as our grafted plants continue to grow. I hope that you enjoyed this post and if you would like to know more check out the resources I used to write this (links below). Please share this blog and if you haven’t yet be sure to follow us on Facebook and Instagram too! Cheers!